If you are using Apache Solr, install it using the Ambari HDP Search management pack. Install the Ambari HDP Search Management pack. For instructions on downloading and using the Ambari HDP Search management pack, see Apache Solr Search Installation. Ensure the Java threat stack size parameter is set to greater than 320kb. The default setting for SOLR_JAVA_STACK_SIZE is not sufficient to start the Solr service. Set Solr environmental variables in ZooKeeper. su $SOLR_USER -c "$SOLR_HOME/bin/solr create -c bro -d $METRON_HOME/config/schema/bro/"
From Ambari, select Metron in the components panel. Click the Configs tab, then click the Rest tab. The source type field name used in the real-time store. Defaults to source:type. The threat triage score field name used in the real-time store. Defaults to threat.triage.score. Click the Configs tab, then click the Indexing tab. 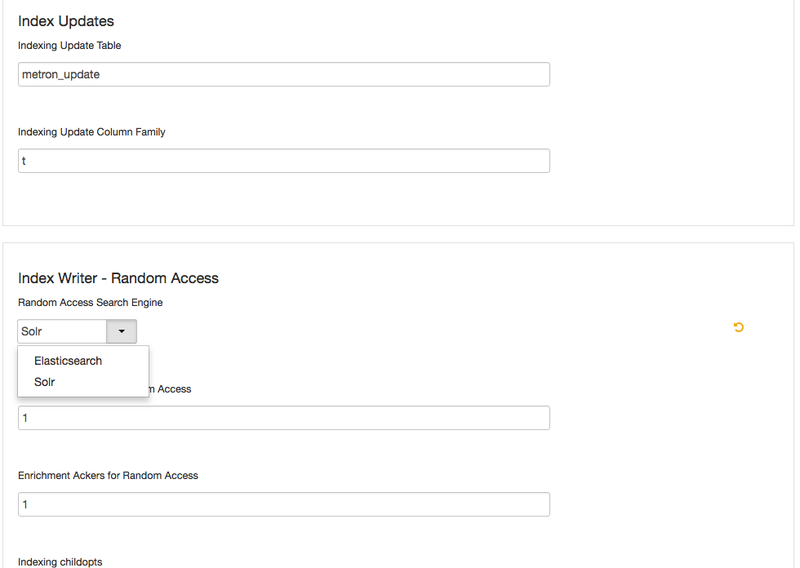 Choose Solr in the Index Writer - Random Access pull down menu. From Ambari, stop and restart the Metron Alerts user interface. From Ambari, stop and restart Metron REST. You can access Solr by choosing Solr UI from the Quick Links pull down menu in Ambari.